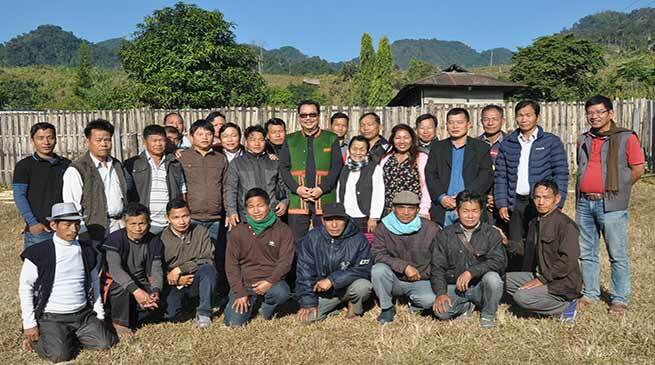 In a meeting with the public leader at BJP Mandal President Office before leaving Dambuk this morning, Deputy Chief Minister, Chowna Mein said to provide last mile connectivity for the benefit of the farming community of the State. He said this while responding to the grievances highlighted by the Public of the area regarding the problems faced by the Orange growers due to absent of road connectivity to most of the orange orchards located in hilly areas. Assuring them to provide last mile connectivity, he asked them to submit the proposal to the Govt. He also said that revolution in terms of infrastructure, agriculture and enterprise development is taking place in the State and urged the educated youths and the people of the area to be a contributor of this development. He further urged them to take optimum benefit of the Govt Welfare Schemes like Chief Minister’s Swalamban Yojana, Krishi Rinn Yojana and others under which Govt is providing loans on subsidized rate to encourage development of local enterprise and 0% interest crop loan to the farmers. While addressing the party worker, he called upon them to strengthen the party in the grass root level by strengthening the Booth level committee. He also urged the youth, Kisan and Mahilla Morcha not to limit themselves only to party activities but to educate the people about the Govt welfare schemes and to play an active role in taking the society forward. He further said to take up the matter of party office in the State Executive Committee regarding the establishment of offices in district and block levels. Parliamentary Secretary for WRD, Gum Tayeng exhorted the party workers to work unitedly and whole heartedly for the upliftment of the party. Tokbom Saring, Anchal Samity Member of Poblung Village while highlighting the grievances of the orange grower said that due to absent of road connectivity to most of the orange orchards in the area which are located in hilly areas, farmers of the area did not get the required benefits for their oranges as heavy expenses are involved in carrying them down to the road sides by head load and most of the fruits get damaged in the transportation. He requested the Govt to provide road connectivity to these orchards. Public Leaders and BJP Mandal Office bearers of Dambuk Sub-Division were present on the occasion.